Many people—like Chesterton, apparently—think of Jesus as a predominantly somber guy, one of those serious religious types with straight laces and a long face. He was so serious, they believe, that he never cracked a joke or shared a laugh. He was just a pious bore. 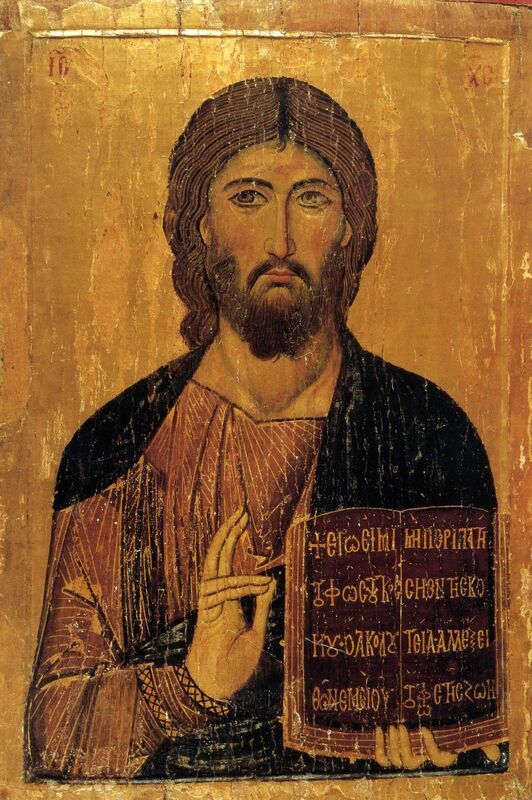 One would certainly get that impression from looking at any number of Byzantine icons—or really at any Jesus art produced by the church up until fairly recently. 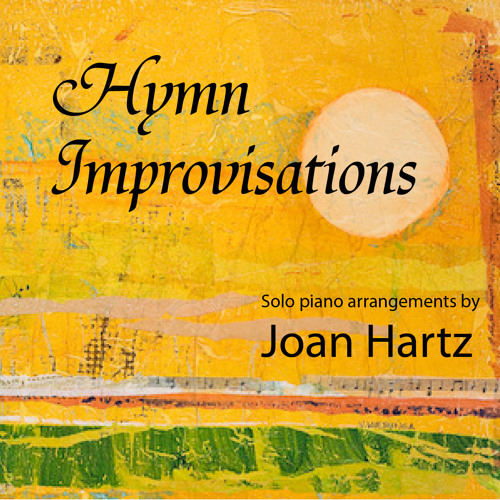 Joyous events, like Jesus’ performance of miracles, his bestowing of blessings, and his resurrection, were depicted stoically. 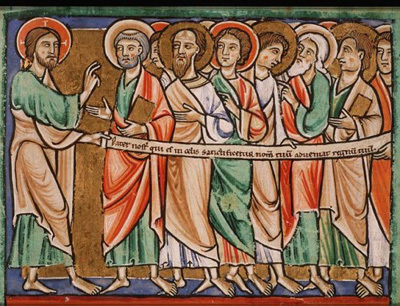 Why medieval artists insisted on always downturning Jesus’ lips instead of upturning them, I don’t know. 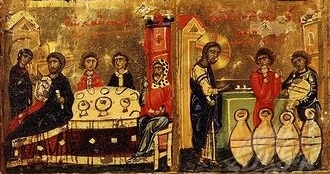 "Wedding at Cana" (detail), 11th c.
"Jesus raises Lazarus," 12th c.
It wasn’t until the twentieth century, it seems, that we were finally able to see Jesus’ teeth, as he was then given, for the first time, a genuine, human smile. The historical Jesus was one happy, humorous guy. He used humor in his teachings and in everyday conversation and exemplified joy in his lifestyle. People loved to hang out with him; he was invited to lots of parties, and young children were naturally drawn to him, so he couldn’t have been a gloomy Gus. Yes, he had some serious things on his mind, and he was certainly not untouched by sorrow (I say in understatement), but I believe that his predominant emotion was joy, a joy that enabled him to transcend any sorrows that he did feel, because it was a joy rooted in his relationship with the Father. 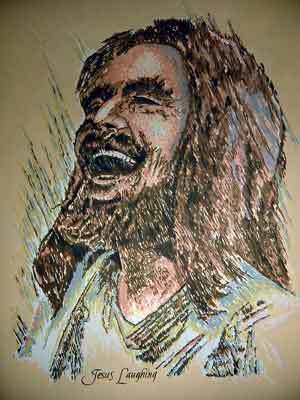 Ralph Kozak, "Jesus Laughing," 1976 (based on a B/W line drawing by Willis Wheatley, 1973). And when I talk about joy, I’m not just talking about that sort of tender joy that radiates from his face in all those sweet Jesus, meek and mild paintings. I’m talking about a joy that he felt in his belly, in a hearty, laugh-out-loud sort of way. 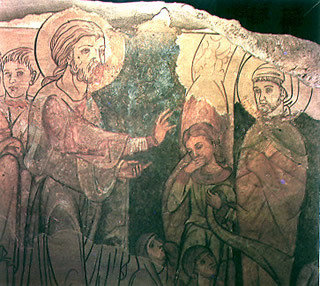 In Luke 7:31-35, Jesus contrasts himself to his cousin John the Baptist, an ascetic. John renounced earthly pleasures and “sang a dirge,” so to speak, but Jesus played a flute and called for dancing. Jesus lived with so much liveliness and mirth and spent so much time in the company of others that his enemies accused him of all kinds of unseemly conduct. “The Son of Man came eating and drinking, and you say, ‘Here is a glutton and a drunkard, a friend of tax collectors and sinners.’ But wisdom is proved right by all her children,” Jesus says. And while Jesus ate and drank and fraternized with outcasts, and traveled around with twelve of his guy buddies for three years, he had to have laughed, or else he wouldn’t have been human. The text has become so familiar to us that it has ceased to evoke immediate reactions. The Gospels stress the tragedy of the crucifixion and preceding events—an intrinsically unhumorous situation. We see this sad picture as the whole picture. I’m not concerned with convincing you that God wants you to rejoice and be eternally happy. If you’ve ever even casually perused the Bible, you would know that. (To cite Pollyanna, one of my favorite childhood heroines, the Bible contains 800 “happy texts”—commandments to “be glad.”) What I am concerned with is that the church comes to see that Jesus did occasionally tell jokes, and he did laugh, and his humor in no way compromises his sacredness. And since Jesus is our behavioral model, we, too, ought to laugh and stop pretending like the more serious we are, the more devout we are. 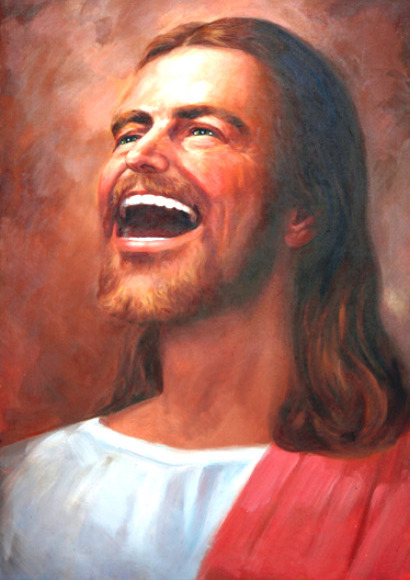 Today, the image of a laughing Jesus is immensely popular in the commercial realm; Christian stores are full of them. 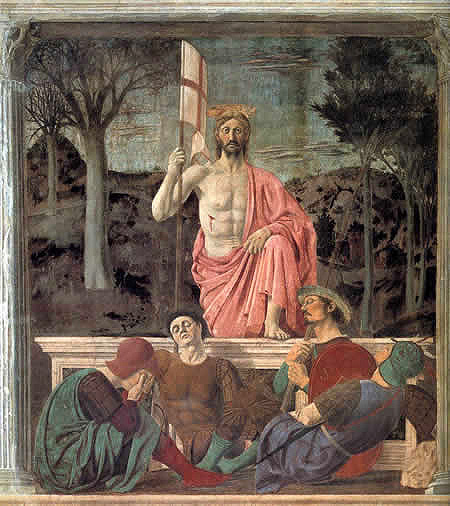 (Churches, however, still seem to cling, for the most part, to artistic depictions of certain tragic Passion events in terms of what they display on their windows, walls, and altars, though some are making the shift, as I’ll show you later this week.) The public’s preference for these happy Jesuses is telling of the way they prefer to relate to him—as a Friend who’s jovial and relaxed. In the three “happy Jesus” artworks I posted here (all of which can be bought on T-shirts, hats, mugs, buttons, magnets, etc., or as framed prints), Jesus is just kicking back and loving life. Do you think they’re over the top? Do they look genuine or fake? Which image of Christ inspires your devotion more: a sorrowful image, or a joyful one? Which brings you more comfort: to know that Jesus cried, or that he laughed? I don’t mean to dichotomize Jesus by asking these either/or questions, to suggest that he possesses only one single emotion or that any one image can address all aspects of his personhood. To do so would be to ignore his infinite complexities. I’m just trying to spark discussion. As for myself, I feel somewhat ambivalent about these pictures. They do appeal to me at some level, because they suggest to me a God who is “fun,” laid back, and approachable, a friend I’d like to spend time “hanging out with” in prayer. Is that who God is? At another level, I just think how funny they look, especially Haggerty’s. But is that because I’ve been steeped in so much medieval and Renaissance art, or because they really are just ridiculous? 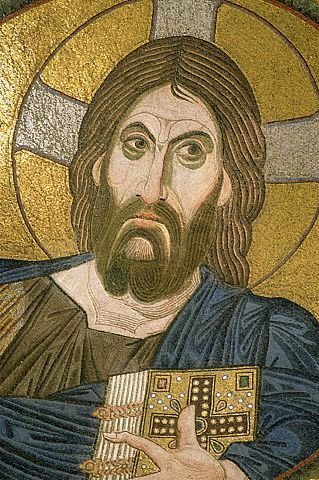 This entry was posted in Popular Art, Who is Jesus? and tagged funny jesus, laughing jesus, smiling jesus. Bookmark the permalink. So what is humor then? The association of seriousness with spirituality probably comes from the idea that humor = not taking something seriously. If this is true, the realms of humor and of religion are apparently mutually exclusive. Is this necessarily humor though? If it is, are there things we could imagine Jesus not taking seriously (for example Psalm 2:4; God doesn’t take the nations’ scheming very seriously), or are we content to imagine Jesus happy but not humorous? And if not, can you think of a better definition? Also, the laughing Jesuses are all extremely creepy. You’re right—being happy or joyful is different than being humorous. I may be trying to lump together too many disparate ideas in this series. While it is generally agreed that Jesus was joyful, there is less agreement as to whether he was humorous. I guess by “humorous” I mean comical or amusing, saying and doing things that might have evoked laughter. Jesus wasn’t always humorous, but he often was. For example, the mental association in the speck/plank illustration in Matthew 7:3-5 is funny: a man with a two-by-four protruding from his eye, trying to help a person get a speck of dust out of his eye. So even though hypocrisy is a serious sin, that didn’t keep Jesus from making fun of it. This is a softer example; other times, he was much more pointed in his criticism. I think that you can take something seriously and still use some form of humor to convey your real earnestness about it. Satire, for example, has been used by writers since ancient times to expose human foibles and flaws. Satirists use all manner of irony and exaggeration and wit to make their target object seem ridiculous, but for a productive end: to shame individuals into improvement. Jesus’ humor wasn’t of the slapstick variety; he wasn’t a jester who was continually cracking jokes or being a goof. He took his mission very seriously, and he took sin seriously. But he sometimes took a humorous approach in his teachings, and he is known for throwing out some funny insults. Thanks for these thoughtful questions. I’ll try to clarify my stance in upcoming posts. Did Jesus’ humor trivialize sin? And if it was meant to be satirical, was it even effective? Do we have the same prerogative as Jesus to call out the self-righteous with biting sarcasm? Stay tuned! 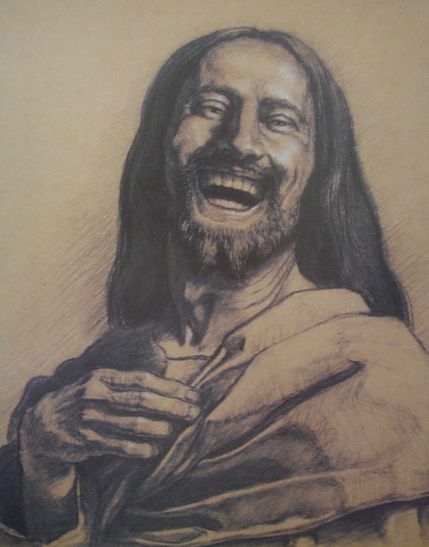 Not everything that Jesus did was recorded; but it makes sense to me that at times he had a great laugh and joke with his disciples as the sat together on the hillsides or as they wandered about. Jesus was a good teacher and we know ourselves from experience that if we had a teacher at school who was relaxed, humorous yet took studies seriously because they cared about you and knew you needed to understand what they were showing you, their lessons stuck with us. You associate your learning with positive emotions, so you remember! Jesus made learning fun! I’m sure of it! I bet he also splashed them with water from the Sea of Galilee, deliberately rocked the boat, teased them and laughed for joy when many of his miracles were carried out. No doubt, these hilarious times were punctuated with times of gravity, sadness and eventually grief.